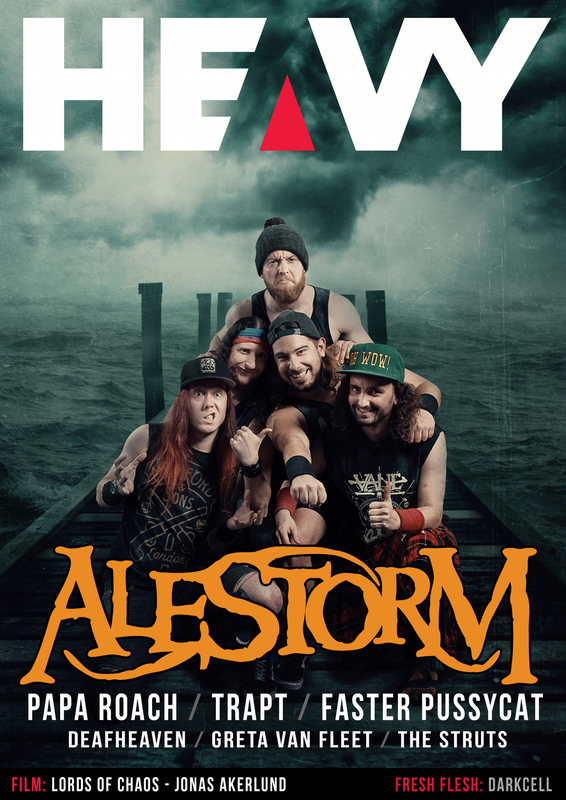 🤘 HEAVY Digi-Magazine🤘Alestorm, Papa Roach, Faster Pussycat, Trapt, Greta Van Fleet, The Struts + more! 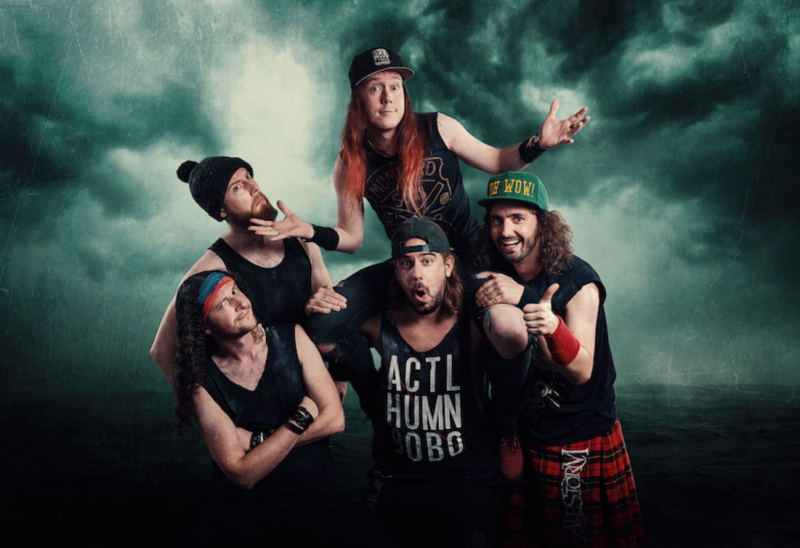 Batten down the hatches Australia those fun-loving pirate metallers Alestorm are heading back to our shores and boy (or should that be buoy?) do they have some wild times planned for their Down Under fans. When HEAVY Mag catches up with front-man Christopher Bowes he is in the middle of a song-writing session but quickly starts to reflect on how long it has been since the band have toured Australia. If there was ever a director who was perfect to be at the helm of a movie that chronicles the tragic events that occurred in the Norwegian black metal scene in the 1990s it is Jonas Akerlund. The story revolving around the bands of Mayhem and Burzum is a story of murder, suicide and arson … The post JONAS AKERLUND Reveals THE LORDS OF CHAOS appeared first on HEAVY Music & Film Magazine. “We wanted to start the year off with a bang”, declared Darkcell vocalist Jesse Dracman, “and what better way to do it than with a song with more hooks than a Hellraiser movie and more groove than a 4th of July explosion so we decided to put out a song which is kind of like … The post Metal Mayhem with DARKCELL appeared first on HEAVY Music & Film Magazine. “It was brilliant, absolutely brilliant”, gushed Luke Spiller, vocalist for The Struts, talking about the first show of his bands support run with Greta Van Fleet in Sydney on Tuesday night. “We flew onto that stage like a bat out of hell and it was absolutely amazing to see how receptive and welcoming the Sydney … The post Strutting Out with THE STRUTS appeared first on HEAVY Music & Film Magazine. “I don’t know”, laughed Deafheaven vocalist and founding member George Clarke when asked what he thought prompted the surprise crossover success of their sophomore album Sunbather. “We got really lucky. It was such a crazy, exciting time and I think that a lot of people felt like what we were doing was fresh and I … The post DEAFHEAVEN Turn Up the Volume appeared first on HEAVY Music & Film Magazine. The wait is finally over for Papa Roach fans as their brand new album – Who Do You Trust? has hit stores. The wait was agonising – not because of the length of time between it and Crooked Teeth but because the tracks released before the album hit stands seemed to suggest that there the … The post Changing Sounds Of PAPA ROACH appeared first on HEAVY Music & Film Magazine. In this episode of the Subculture podcast Dave Griffiths and Harley Woods sit down and chat to Christopher Sabat about his role in one of the most eagerly anticipated animes of 2019 – Dragon Ball Super: Broly. Dragon Ball Super: Broly is in Australian cinemas now. The post Subculture Ep #039 – DRAGON BALL SUPER: BROLY appeared first on HEAVY Music & Film Magazine. When Californian hard rockers Trapt first arrived in Australia in 2017 they didn’t know what they were going to be in for. Since their debut in 1997 he band had built a steady following of Australian fans, and while they had shared the stage worldwide with acts like Hinder, Motley Crue and Nickelback they are … The post Getting TRAPT With CHRIS TAYLOR BROWN appeared first on HEAVY Music & Film Magazine. They say a writer produces their best work when they are writing what they know – not necessary a topic they have researched but instead writing from the heart. That is certainly the case for American writer/director Mike Kravinsky and his new powerful film Nothing To Do. This film came from Kravinsky having to help … The post MIKE KRAVINSKY On NOTHING TO DO appeared first on HEAVY Music & Film Magazine. The last couple of years have been enormous for Michigan’s very own Greta Van Fleet. The hard rockers exploded onto the music scene with their debut album Anthem Of The Peaceful Army. The album saw success right around the world and in December the band found themselves being nominated for four Grammy Awards. Now the … The post The Making Of GRETA VAN FLEET appeared first on HEAVY Music & Film Magazine. When you think of music for kids you think of groups like The Wiggles and Hi-5. Well if you want your kids to listen to something a little rockier we have a saviour on the way with Bunny Racket. The brain child of Andy Walker (aka King Bunny) Bunny Racket also features Robbie Krieger from … The post Hop To The BUNNY RACKET appeared first on HEAVY Music & Film Magazine. READ / LISTEN TO PART 1 HERE: https://heavymag.com.au/getting-downe-with-faster-pussycat-part-1-of-2/ LA – late 1980s early 1990s and the hard rock scene was being dominated by the likes of Guns ‘N’ Roses, Motley Crue, Warrant and Poison. There was also another band though that was winning over a legion of fans – Faster Pussycat. Their self-titled debut caused … The post Getting DOWNE With FASTER PUSSYCAT – Part 2 appeared first on HEAVY Music & Film Magazine. LA – late 1980s early 1990s and the hard rock scene was being dominated by the likes of Guns ‘N’ Rose, Motley Crue, Warrant and Poison. There was also another band though that was winning over a legion of fans – Faster Pussycat. Their self-titled debut caused a stir in 1987 and their follow-up album … The post Getting DOWNE With FASTER PUSSYCAT – Part 1 appeared first on HEAVY Music & Film Magazine. Mighty warriors of the galaxy! GLORYHAMMER are about to return from another epic quest, and they come bearing their new album, Legends From Beyond The Galactic Terrorvortex! Today we received the cover of the third chapter of the mighty GLORYHAMMER saga. The galaxy waits in fear for the return of Angus McFife XIII, who fought … The post GLORYHAMMER Unveil New Album Cover And Title appeared first on HEAVY Music & Film Magazine. TEMPERANCE Joins Forces With Napalm Records! Rockers Tremonti have just released another music video for the latest single from the band’s Napalm Records release, A Dying Machine. “Throw Them To The Lions” is an up-tempo metal song, something that Tremonti has come to be known for over their multiple releases through the years. The video was filmed at a recent sold-out show … The post TREMONTI Releases Music Video For Next Single “Throw Them To The Lions” appeared first on HEAVY Music & Film Magazine. UK black hearted extremists Anaal Nathrakh will descend on Australia in early March for their first ever Headline tour. The band released their latest terrifying slab of hatred, A New Kind Of Horror, in September of 2018 and it was hailed as some of their best work ever. Anaal Nathrakh was created for one purpose – … The post ANAAL NATHRAKH Announce Aussie tour For March with Guests Hybrid Nightmares appeared first on HEAVY Music & Film Magazine. ELUVEITIE have long found their very own trademark sound, a sonic adventure based in Celtic visions of a Gaulish past, and the band are excited to be bringing their brand new line-up, darkly atmospheric new album Ategnatos and classic works from their entire 17-year history to Australian fans. This May, Australia will witness the most epic performances this Swiss metal … The post An Evening With ELUVEITIE – Australian Tour Announced appeared first on HEAVY Music & Film Magazine. San Diego psych heavyweights Earthless – who hit Australia and New Zealand late February – have announced the support acts for their upcoming tour, and it’s a killer bunch of groups, meaning every show is gonna be loaded with heavy and heady psychedelic and hard rock greatness. The tour kicks off at Max Watts in … The post EARTHLESS Announce Local Supports appeared first on HEAVY Music & Film Magazine. HALESTORM, CLUTCH, STONE TEMPLE PILOTS, BEHEMOTH, FEVER 333, BEARTOOTH AND MORE ACTS ADDED TO THIS YEAR’S LINE UP AARON BUCHANAN & THE CULT CLASSICS | ALCEST | ANIMALS AS LEADERS | AT THE GATES | BAD WOLVES BATUSHKA | BEARTOOTH | BEHEMOTH | BLACK PEAKS | BROTHERS OSBORNE | CANE HILL | CLUTCH | COLDRAIN … The post DOWNLOAD FESTIVAL UK Add 43 More Acts To Mammoth Line Up appeared first on HEAVY Music & Film Magazine. Pop Punkers out of Maryland Angel Du$t have announced details of their new LP Pretty Buff, which will be released March 15th on Roadrunner Records. The band has also shared two new tracks – Bang My Drum and On My Way – which are streaming now along with an official music video for Bang My Drum. PRETTY BUFF marks Angel Du$t’s Roadrunner Records debut … The post Angel Du$t announce details of their new LP Pretty Buff appeared first on HEAVY Music & Film Magazine. Today, Darwin locals Tapestry are today announcing their Autumn Tour 2019 promoting their latest EP Ghost of Me, alongside their mates Vacant Homeand & Whatever, Forever and to celebrate this epic tour, they have also dropped a short documentary about their hometown Darwin EP launch show. The tour in late March takes them to Newcastle’s Hamilton Hotel, both Sydney … The post TAPESTRY Announce Debut Headlining East Coast Tour appeared first on HEAVY Music & Film Magazine. Port Augusta based Metalcore outfit Alda Sky have just released a brand new music video ‘Odium’. Alda Sky combine hard-hitting riffs, catchy guitar/vocal melodies and technical playing styles to achieve their distinctive sound. The band released their debut EP ‘Reflections’ in May 2017 to a very warm reception. The EP charted at #2 on the ITunes Metal Album Charts for one week. ‘Reflections’ was … The post ALDA Sky Release Odium appeared first on HEAVY Music & Film Magazine. 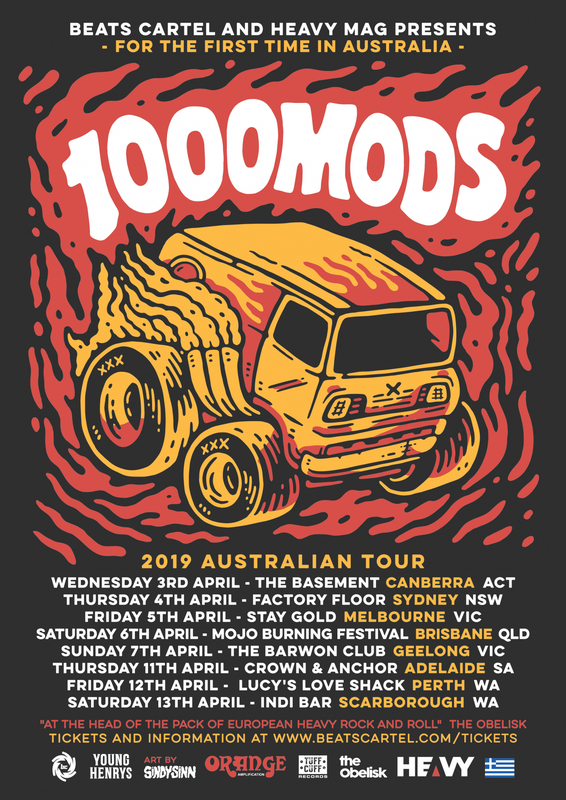 Back in 2016, dropping like an atom bomb from the sky and with not even the slightest bit of pre-warning, Sydney Prog rockers Cog announced their triumphant return on social media – a short tour to test out the waters in the major eastern capital cities. Within the hour all three cities had sold out … The post COG at Quayside Terminal Townsville on 25/01/19 appeared first on HEAVY Music & Film Magazine. Gathered in Melbourne, specifically at The Croxton Bandroom on this the 26th of January was a diverse crowd of punters and participants for Progfest 2019 who were about to witness a full line-up and showcase of some of this country’s upcoming and finest representatives of more than just heavy music, but clearly artistry and proficiency … The post PROGFEST 2019 at The Croxton, Melbourne on 26/01/2019 appeared first on HEAVY Music & Film Magazine. The post PROGFEST at Factory Theatre, Sydney 27/01/19 appeared first on HEAVY Music & Film Magazine. The post STICK TO YOUR GUNS and Terror at Crowbar, Sydney 27/1/19 appeared first on HEAVY Music & Film Magazine. The post SLASH and DEVILSKIN at Qudos Bank Arena 28/1/19 appeared first on HEAVY Music & Film Magazine. The Fever 333 Thrice Bring Me The Horizon The post BRING ME THE HORIZON at CFE Arena, Orlando, FL on 25/1/19 appeared first on HEAVY Music & Film Magazine. Voivod Contrive Head In A Jar The post VOIVOD and Contrive at Crowbar Sydney on 26/1/19 appeared first on HEAVY Music & Film Magazine. The post THE OCEAN and TOEHIDER at Badlands Bar, Perth on 24/1/19 appeared first on HEAVY Music & Film Magazine. THE PRODIGY The post THE PRODIGY and SHOCKONE at RAC Arena, Perth on 24/01/19 appeared first on HEAVY Music & Film Magazine.